Egyptian security guards intervene and detain scores of Morsi supporters who gathered in Alexandria on November 4, 2013 to denounce Morsi's trial in Egypt. AA/ABACA/Press Association Images. All rights reserved.The 2013 Egyptian coup, which overthrew the democratically elected Muslim Brotherhood president Mohamed Morsi, strengthened the anti-political Islam camp while hardening its attitudes. Besides advocating the complete exclusion and repression of Islamist groups, this camp also lumps jihadists and peaceful political parties together. The rigidity and anti-democratic hypocrisy of such attitudes recalls anti-communist sentiment in the US during the Cold War, when many ordinary Americans and their government could not grasp that the repression practiced by right-wing US-allied regimes was just as ruthless as that applied in the Soviet Union and by its allies. The thinking was that an autocratic right-wing government was far better than the communist alternative. With this worldview as a foundation, the US government readily looked the other way as human rights were violated. The current coalition against nonviolent political Islam, sadly, includes some of the youthful protestors at the vanguard of the 2010-2011 Arab Spring who now harbor uncompromising attitudes toward the Muslim Brotherhood and other Islamist groups. In the worst cases, their ‘allergy’ to political Islam is so severe that it clouds their ability to empathize with the human rights of fellow citizens. After the 2013 coup in Egypt, many of those who called for Mubarak’s removal in 2011 not only remained silent, but actively cheered, the violent crackdown on Muslim Brotherhood supporters. An uncompromising attitude toward political Islam is first and foremost the consequence of many decades of state-driven propaganda which has convinced a critical mass of Arab citizens and foreigners that political Islam constitutes an existential threat to the state and needs to be put down, at any cost to democracy and human rights. Historically, Arab autocrats at times co-opted political Islam for their own purposes, but mostly they repressed Islamist movements in the most brutal ways, as we are learning from the work of the Tunisian Truth and Dignity Commission. What Sisi and the Egyptian military really fear is not Islamists but democracy itself. Islamist political parties may play the democratic game, the autocrats said, but once in power they will trample on personal freedoms and capture state institutions. The autocrats also convinced American and European leaders that their regimes were the only bulwark against extremism. 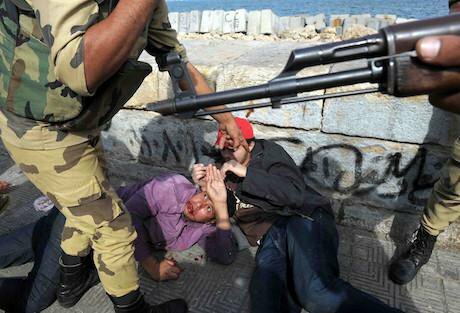 Today, the regime that rules Egypt, the most populous Arab country, has returned to these well-trodden tactics. Its leader, Abdel Fattah El Sisi, plays up the threat of Islamism as a way to bolster his internal and external support and justify repression. What Sisi and the Egyptian military really fear is not Islamists but democracy itself. Nevertheless, many Egyptians have bought into the narrative that strongman rule is the only bulwark against chaos and Islamic theocracy. In anti-Islamist discourse, the Muslim Brotherhood is indistinguishable from violent jihadist groups. Never mind that Islamists have peacefully participated in parliamentary politics in countries such as Kuwait, Morocco and Jordan for many years now, and in Tunisia since 2011. The anti-Islamist propaganda narrative in Egypt leaves this fact out, and instead the Sisi regime has declared the Egyptian Muslim Brotherhood a terrorist group. Sisi has also reinstated the Emergency Law, which in modern Egyptian history has been used to silence opposition while doing little to quell terrorist attacks. In Tunisia, anti-Islamist sentiments have been exploited for political purposes and to distract citizens and outsiders from anti-democratic practices. Tunisian president Beji Caid Essebsi, who spent most of his career serving dictators, recently pushed to end a ban on Tunisian women marrying non-Muslim men and called for changes to gender-discriminatory gender laws. Yet, he has done little to reform Tunisia’s interior ministry and police, well known as sources of repression, and has presided over a troubling rollback of democratic principles. This uncompromising anti-Islamist line has powerful external sponsors. The United Arab Emirates uses its financial and diplomatic clout (at times in alliance with other Gulf Arab allies) in a relentless campaign against the Muslim Brotherhood. The Emiratis have supported anti-Islamist figures like Eastern Libya’s self-styled strongman Khalifa Hiftar, whose militias commit well-documented human rights abuses in the name of fighting Islamists. Saudi Arabia has also intervened in support of politically “quietist” Libyan Salafists. The wave of nationalism and populism sweeping across western societies (which features Islamophobia as one of its main tenets) has also bought into the anti-Islamist narrative with the help of Russian information warfare. This has helped convince many Europeans that in the Arab world, autocracy is the only defense against radical Islam. As a consequence, European right-wing populist parties and their followers express support for Bashar al-Assad, who is fighting a noble battle against jihadists. Never mind that he is also backed by the theocratic Iran and scores of religiously-motivated Shia militias. All of this lowers the potential for Europe, never a champion of Arab democracy, to be a positive force for reform in the Arab world. In April 2017, a photograph of Egyptian president Sisi, by most measures more repressive than former president Hosni Mubarak, sitting next to Trump in the White House spoke volumes about the priorities of the administration and its readiness to buy into the time-tested appeals of Arab autocrats to American presidents. Meanwhile, Trump's son-in-law and advisor Jared Kushner have forged close friendships with Saudi and Emirati royalty. The post-Arab Spring campaign against political Islam has been used again and again to justify political exclusion and human rights abuses. Its rigid ideological approach only further entrenches authoritarianism and promotes feelings of marginalization, which can drive extremism. Egyptians, Libyans, Tunisians, and other Arabs deserve better than to be told that they must choose between extremism and chaos on one hand or autocracy on the other. It is also time that courageous western leaders openly challenge the premises and methods of the campaign against nonviolent political Islam, not because they agree with the program of nonviolent Islamist parties, but rather because they care about democracy.